We are happy to send you the second newsletter and to share the news from both of the domain and of our wines. 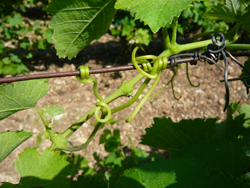 The vine is a creeper – it’s in its genes to be a creeper. It lived originally in the forests and climbed over the trees. It attached itself to the trees by means of its tendrils. Today the forest is replaced by trellising with wire and stakes. 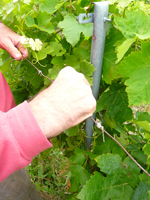 In May, with the humidity and heat of the time, the vines grew very fast and out-grew the top wire of the trellising. It was important to protect the young fragile shoots which could break in a strong Mistral. Many wine growers pruned the long shoots, while at the same time cutting back the apex – what a shame. In our Biodynamic view, to cut back or prune the apex damages the maturity of the grapes. We prefer to add a line of wire trellising to the top of the existing trellising so as to support the vines, and keep them straight. As the vines grow longer, we wind them around this extra line of trellising. 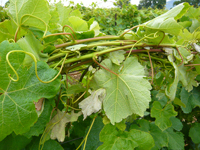 In this way, we have well aerated grapes and keep all the leaves to give good photosynthesis. At the domain, this work took up most of the time of our team during the months of May and June. 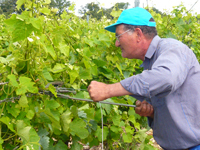 We recruited seasonal workers to help us with the enormous growth spurt of the vines. This year two students came to give a helping hand to our annual team. 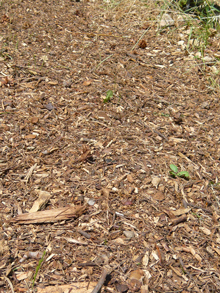 BRF (Bois Raméal Fragmenté) is the French definition for Ramial Chipped Wood. We are experimenting with this technique on a parcel of the ‘Clos’ since 2008 to see how to reconcile agriculture with the forest. Due to a meeting of circumstances, this method came from Quebec in 1970. The method takes its name from this matter – that is to say this Ramial Chipped Wood, which is spread on the land. The ‘wood matter’ contains ‘Lignine’, a structural sugar which gives a natural rigidity. ‘Raméal’ means young boughs or branches which are leafy and perfumed, preferentially of a diameter of 7cms. They contain this ‘Lignine’ which the natural fungi of the land can digest. It is ‘fragmenté’ or chipped using a grinder, giving them a form which is easy to spread. This chipped matter is then in direct contact with the land and all that lies below it. In working like this, we are reacting just as nature does in the forest. The wind and rain drive the leaves, twigs and branches to the ground. For millions of years the forest floor has been composed of this matter and thus plays a role as our ‘food protector’. To re-create on our land, by a system of mono-culture, a humid atmosphere such as exists in the under wood, seems a very interesting direction to take for the future of the vines and the land. Flowering started on 23/05/09 on our Syrah and Grenache on the parcel of Vacqueyras ‘Le Clos’. Contrary to other years, flowering lasted 15 days instead of one month. It went well, and promises a good harvest. We had an episode of stormy, rainy weather accompanied by hail on the 20/04/09. A lovely birthday present for Eric just before his 45th birthday. Luckily, very few parcels were damaged. We had however a loss of 20 – 30% on 16 hectares. We can draw the conclusion therefore that the rainy spring re-constituted and hydrated the water table. We start the summer serenely. 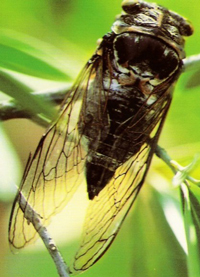 Each year we notice the first singing of the cicada on the parcel of the ‘Clos’. We noticed that approximately 2 months and 22 days later, is the start of the harvest for us. This year the cicada first sang on the 15th June. Date for the harvest: the 7th or 8th of Sept. The 8th would be a good date because it’s a fruit day! Hygiene in the cellar, where we use no chemical products to clean, must be faultless. The smallest detail in this regard has been our pre-occupation since we started production. A good example is the joints we use to join pipes together (pipes used to change wine from one vat to another for example). The joints are called ‘Din’. Since their conception, they are easy to clean very well. A complete and thorough cleaning can be achieved by using very hot water at 90°c. The maturing of the 2008 wines is going well. The process is evolving nicely and a lovely freshness is expected from the Montirius wines. We are coming into the very hot period of the year and the wines need to be protected from the heat to prevent them maturing too fast. Another winter will be necessary to finalise their evolution in the vats. Our red Vacqueyras has been chosen as one of the wines of the Canteen of the General Assembly. Their wine list now has biodynamic wines. More info on our web site – press column. We made a presentation of our Montirius red Gigondas ‘Confidentiel’ 2004 to Mr Andreas Larsson, world-renowned wine expert. Three wine tastings were done at 6-month intervals – the 28/05/08, the 14/10/08 and the 03/03/09. His ever-laudatory comments show that the wine shows itself evermore complex and expressive with the passage of time. During the wine tasting at Biodyvin, the Bordeaux primeurs, in April 2009, we presented our Vacqueyras ‘Le Clos’ and our Gigondas ‘Terre des Aînés’ 2008 to the press (samples taken from maturing vats).This event was held at the Chateau Fonroque at St Emilion. Both the Vacqueyras and the Gigondas from Montirius received three and four stars. The colour is an intense red, brilliant ruby. On the nose it emits odours of ripe red fruits – very fresh. In the mouth, the crispness of red fruits, soft tannins, and smoothness, makes this well balanced wine an agreeable friend for summer meals. Read the the article of the Revue des Vins de France, our web site – press column. A silver medal at the Concours Decanter 2009 for our Montirius red Gigondas ‘Confidentiel’ 2006. More info on our web site – medals column. Our red Montirius ‘Confidentiel’ 2004 on the wine list of the world’s 3rd best restaurant !! The restaurant ‘Noma’ with its chef Mr René Redzepi, has just been elected 3rd best restaurant in the world. Our Montirius red Gigondas ‘Confidentiel’ 2004 is on their wine list ! Our Montirius Vacqueyras ‘Le Clos’ 2005 cuvée special of the Avignon Festival for the 3rd year running. For the third year running, we have been selected as the ‘Cuvée du Festival d’Avignon 2009’ with our Montirius red Vacqueyras ‘Le Clos’ 2005. The selection is made by blind tasting by well-known sommeliers or wine experts, sponsored by the restaurant ‘Christian Etienne’ and their wine expert sommelier Nicolas Hong. This recipe will be in a perfect accordance to a Vacqueyras red Montirius “Le Clos” 2004. Ask you butcher to bone the shoulder of lamb for you or do it yourself if you are handy with a knife. Use the bones to make stock for the gravy. Put the olives, garlic, anchovies and olive oil into a food processor and whizz for a few seconds – just long enough to chop the olives fairly coarsely: it shouldn’t be a purée. Score the fat of the lamb lightly, then put the meat skin side down on your worktop, remove surplus fat from the inside, spread the olive mixture over the lamb and roll lengthways, tying at regular intervals with the string. Sprinkle lightly with salt and roast in a preheated moderate oven, 350°F regulo 4, for 1 ¼ hours approx. This will produce lamb with a faint pink tinge. Remove to a carving dish and allow to rest while you make the gravy in the usual way. Carve at the table and serve with a little gravy, some rustic potatoes. Discover a presentation of our domain on our web site ‘domain on video’, under the heading ‘Chosen moments’. If you would like to participate in one of our wine tasting workshops, don’t hesitate to contact us to sign up !